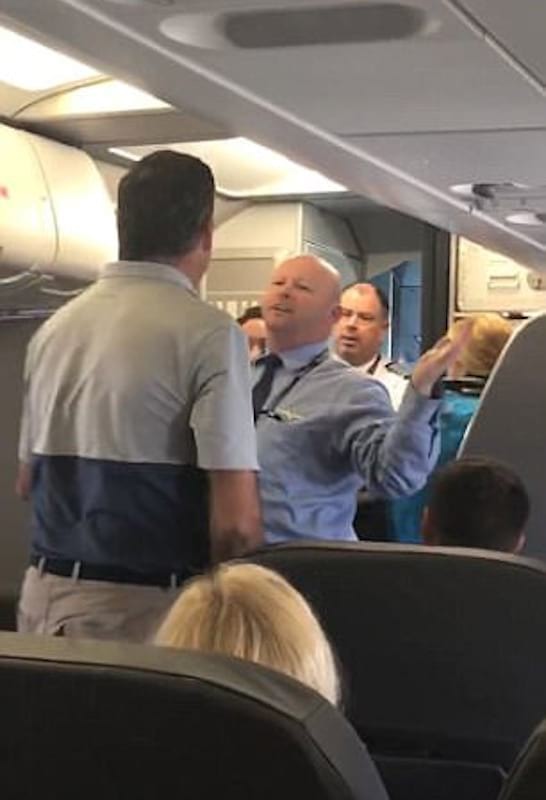 An American Airlines staff member has been “removed from duty” after video emerged showing him in a heated confrontation with a passenger. In a video posted to Facebook a woman aboard the flight can be seen crying with a child in her arms after allegedly being hit with a stroller on flight AA591 from San Francisco to Dallas-Fort Worth. The woman, who was standing at an entry to the plane, can be heard telling staff to “just give me back my stroller please”. Airline staff offered the distraught woman some water before a male passenger aboard the plane stood up to defend her. The passenger demanded to know the name of the airline staff member who allegedly hit the woman with the stroller. “Is he an American Airlines employee?” the man asked other staff members. “AA flight attendant violently took a stroller from a lady with her baby on my flight, hitting her and just missing the baby,” Surain Adyanthaya captioned the Facebook video. A heated confrontation ensued, where the employee told the man to “stay out of this”. “You don’t know what the story is,” the staff member can be heard shouting. “I don’t care what the story is, you almost hurt a baby,” the passenger shouted back. American Airlines has since responded, releasing a statement claiming they’ve “started an investigation to obtain the facts”. What we see on this video does not reflect our values or how we care for our customers.We are deeply sorry for the pain we have caused this passenger and her family and to any other customers affected by the incident. We are making sure all of her family’s needs are being met while she is in our care. After electing to take another flight, we are taking special care of her and her family and upgrading them to first class for the remainder of their international trip. The actions of our team member captured here do not appear to reflect patience or empathy, two values necessary for customer care.In short, we are disappointed by these actions. The American team member has been removed from duty while we immediately investigate this incident.